Semi steel wheels feature a high weight capacity with effortless rolling under heavy loads. 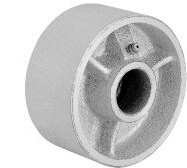 Abrasion resistant, long wearing wheel choice for industrial and commercial applications. Wheel face (tread) and hub length are machine finished. Select the appropriate wheel bearing for optimum semi steel wheel operation. Please call toll free 1-888-904-9531 for more information and to order semi steel wheels. NCC-SSS2510 2-1/2 15/16 1-3/8 5-16 135 - "
NCC-SSS314 3 1-1/4 1-9/16 3/8 165 - "
NCC-SSS414 4 1-1/4 1-1/2 1/2 300 3/8 "
NCC-SSS414-1 13/16 4 1-1/4 1-13/16 1/2 300 3/8 "
NCC-SSS514 5 1-1/4 1-1/2 1/2 300 3/8 "
NCC-SSR3420 3-1/4 2 2-3/16 1-3/16 700 5/8 and 3/4 "
NCC-SSR415 4 1-1/2 1-5/8 1-3/16 600 5/8 and 3/4 "
NCC-SSR420 4 2 2-3/16 1-3/16 700 5/8 and 3/4 "
NCC-SSR515 5 1-1/2 1-5/8 1-3/16 600 5/8 and 3/4 "
NCC-SSR520 5 2 2-3/16 1-3/16 1000 5/8 and 3/4 "
NCC-SSR525 5 1-1/2 2-3/4 1-15/16 1800 1 and 1-1/4 "
NCC-SSR615 6 1-1/2 1-5/8 1-3/16 700 5/8 and 3/4 "
NCC-SSR620 6 2 2-3/16 1-3/16 1200 5/8 and 3/4 "
NCC-SSR625-1 13/16 6 2-1/2 2-3/4 1-3/16 1600 5/8 and 3/4 "
NCC-SSR625 6 2-1/2 2-3/4 1-15/16 1800 1 and 1-1/4 "
NCC-SSR625-3 1/4 6 2-1/2 3-1/4 1-15/16 1800 1 and 1-1/4 "
NCC-SSR630 6 3 3-1/4 1-15/16 2500 1 and 1-1/4 "
NCC-SSR825-1 13/16 8 2-1/2 2-3/4 1-3/16 1600 3/4 "
NCC-SSR825 8 2-1/2 2-3/4 1-15/16 1900 1 and 1-1/4 "
NCC-SSR825-3 1/4 8 2-1/2 3-1/4 1-15/16 1900 1 and 1-1/4 "
NCC-SSR830 8 3 3-1/4 1-15/16 2500 1 and 1-1/4 "
NCC-SSR1025-1 13/16 10 2-1/2 2-3/4 1-3/16 1800 3/4 "
NCC-SSR1025 10 2-1/2 2-3/4 1-15/16 2000 1 and 1-1/4 "
NCC-SSR1025-3 1/4 10 2-1/2 3-1/4 1-15/16 2000 1 and 1-1/4 "
NCC-SSR1030 10 3 3-1/4 1-15/16 2500 1 and 1-1/4 "
NCC-SSR1225 12 2-1/2 2-3/4 1-15/16 1800 1 and 1-1/4 "
NCC-SSR1225-3 1/4 12 2-1/2 3-1/4 1-15/16 1800 1 and 1-1/4 "
NCC-SSR1230 12 3 3-1/4 1-15/16 2500 1 and 1-1/4 "